Ginseng is often referred to as a miracle herb. According to the University of Maryland Medical Center, studies have shown that ginseng can benefit people with conditions, such as diabetes, attention deficit hyperactivity disorder, cancer and the flu. In the United States, ginseng is best known in powder, capsule and raw form. It is generally consumed to help strengthen the immune system and help the body's overall functioning. Eat raw ginseng root. Wash the raw ginger root and steam it for 5 to 10 minutes, so that it softens and is easier to cut up. Cut the root into thin slices that are easy to consume. Avoid letting the root cool and harden. Cover the slices with honey and preserve them in the fridge in an air-tight container. Consume up to two slices daily to enjoy full benefits. Consume ginseng in soup form. Prepare chicken soup according to your favorite recipe. Add a handful of ginseng slices to the soup. Simmer the soup up to 2 hours. Mash up the softened slices and mix them into the soup. Take the slices out of the soup and eat them as is, as an alternative. Make ginseng tea. 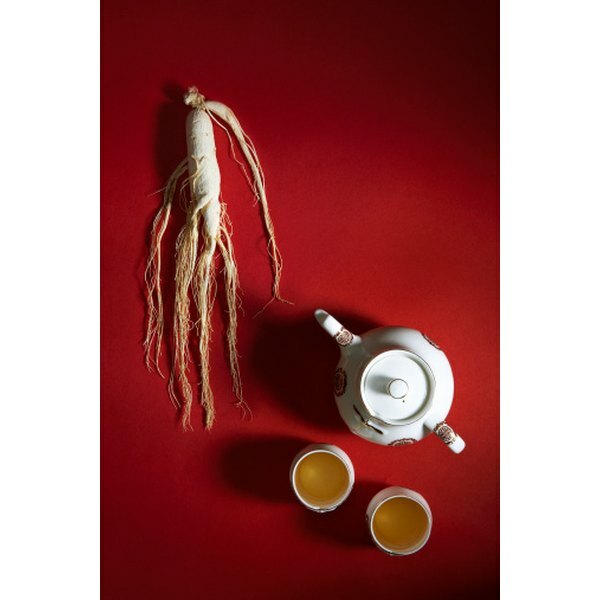 Place five slices of ginseng root into a cup. Add hot water to the ginseng and let it seep for 5 minutes. Drink the liquid. Let the tea seep longer if you desire a stronger tea or use more ginseng slices. Reuse the slices up to three times to make ginseng tea. Use 1 tsp. of ginseng powder as an alternative to the slices. Take ginseng capsules. Purchase over-the-counter ginseng capsules and take them with water, according to the packaging instructions. Use ginseng when cooking. Add ginseng powder to the water when you cook rice or add ginger slices or ginger root in stir-fry dishes. Consume ginseng before having a meal to get the full benefits. Purchase various forms of ginseng from health and herbal stores.